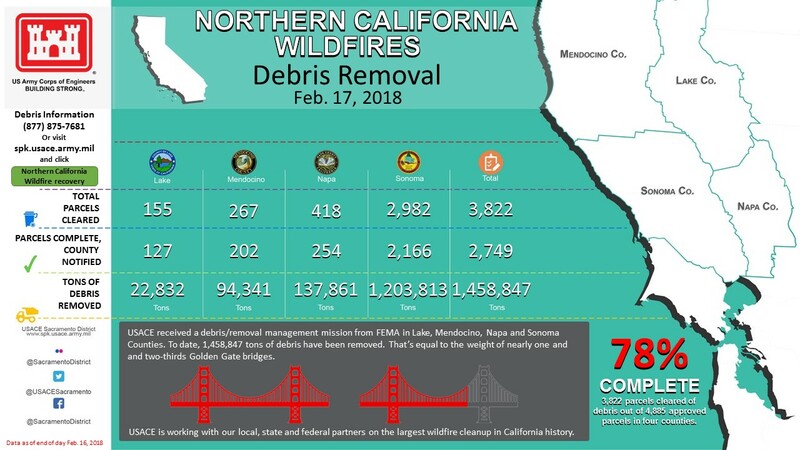 California’s biggest disaster cleanup in a century is now three-quarters complete, according to the Army Corps of Engineers. And like the North Bay fires that caused it, this massive response is one for the record books. But unlike after the 1906 quake, when people dumped debris in the bay and took bricks home in wheelbarrows to shore up their own property, current laws require that debris be safely removed, for the environment and public health. State and local officials also say they hope to recycle or re-use about half the recovered material. A typical residential parcel yields 200 to 250 tons of material. By the time cleanup is complete, thousands of truck trips will have removed about 2 million tons of debris: that’s double the weight of the Golden Gate Bridge. Household hazardous waste was the first problem to tackle: the propane tanks, motor oil, pesticides, paint hanging around garages or sheds. The Environmental Protection Agency and state toxic regulators helped crews pick it out of the rubble safely; they finished last fall. In a second phase, Army Corps contractors are separating concrete from ash and metal, for transport to different places. It's finicky work. Separated debris follows different routes to different fates. Drew’s crew will recycle usable metal for scrap. Once crushed, concrete can find a second use below asphalt in roads, or if pulverized, that material can be recycled for new concrete. Ashy wood and home debris, black, white, or gray, threatens public health if airborne or dumped into a river. Crews wet it down or fold it into a “burrito wrap” – a sheet to keep toxic particulates out of the air while it's in the bed of a truck headed for the dump. An array of regulations control landfill operations under normal circumstances, limiting how many trucks can go there each day, how much they can leave, and what materials a landfill can take in. But after the fires, state and county response managers obtained waivers for some of these rules. Consequently, some landfills are seeing five to eight times as much traffic, not to mention long lines. Every truck carrying disaster debris also requires special paperwork. Nevertheless, the cleanup itself is a declared health emergency. 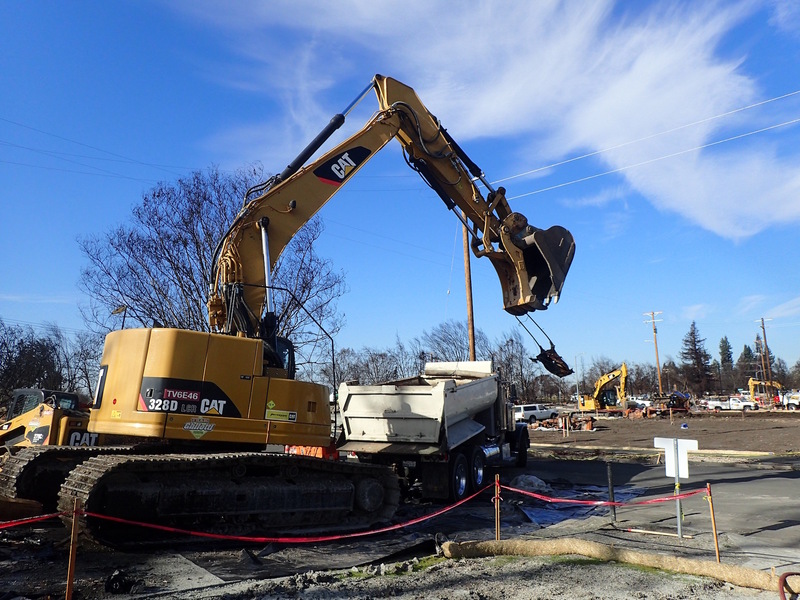 CalRecycle’s Lance Klug emphasizes that waivers don’t lower significant rules, or permit toxic and hazardous material from being dumped just anywhere. For example, local codes still prohibit draining your pool water, which could carry chlorine and ash, into a waterway. Fire certainly speeds the consumption of landfill space, but may not shorten the lifespan of an expandable dump site. 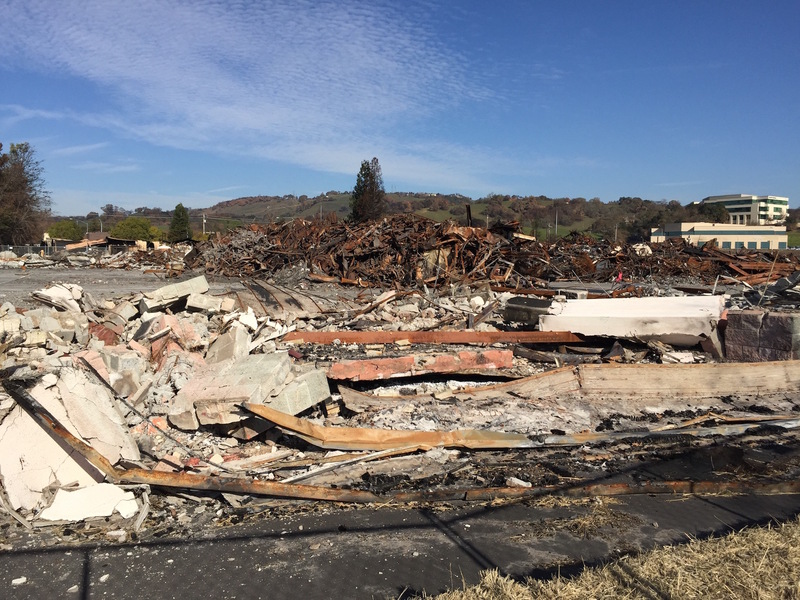 A supervisor in Lake County has said that fire debris will take up a third of the county’s available landfill -- what the industry calls "airspace" -- shaving about 4 years off the landfill's projected life. Officials in Sonoma County and Cal Recycling acknowledge that landfills there may require expansion sooner than planned, but they say those in use have plenty of room left. 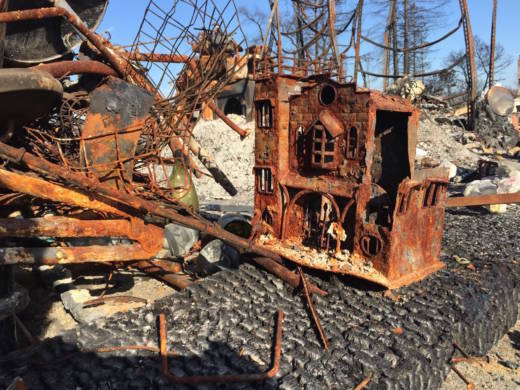 The scale of debris removal isn’t the only reason it’s shocking: fires this destructive haven’t commonly happened in the North Bay, so there’s no practiced history of responding to them. Along the Gulf Coast, where hurricanes like Katrina and Harvey have repeatedly wreaked havoc, tens of tons of debris have scattered across a dozen states. State officials and fire scientists say that if we become accustomed to catastrophic fires, we’ll have to also accustom ourselves to recovering from their wrath.